During the Digital Methods Winterschool 2012 we worked on a project called Track the Trackers. The cloud seems to be a buzz word; what it refers to could be difficult to grasp. This project aims to make (some parts) of the cloud tangible. The project focuses on devices that track users online and show their encounters with the cloud, both those that require active participation of the user (through widgets) and those encounters that are automated (through tags, web bugs, pixels and beacons). For this purpose we have re-purposed Ghostery, a browser plugin that informs users which companies are present on websites they visit to build a custom tool for tracker detection. We focus on automated tracking devices, that operate as default setting once a user requests a website and widgets, including social buttons, which require user action to set further data transmission in motion. We use a wide definition of “tracker”, including a number of devices that allow for user-data collection, such as internal tracking devices, bugs, widgets, external analytic services and further interfaces to the cloud. 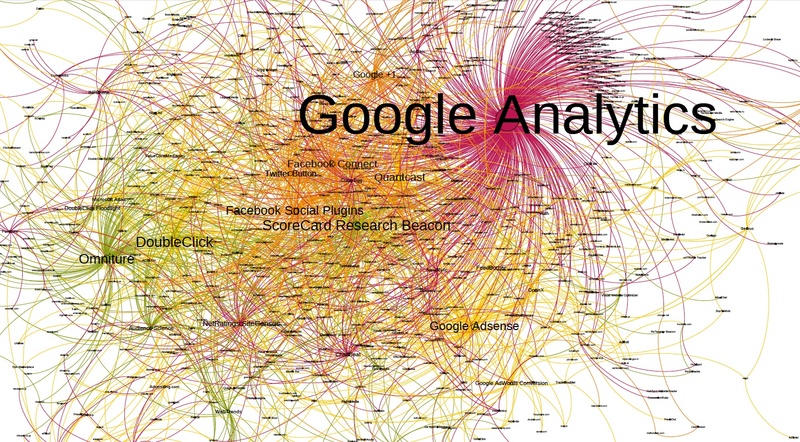 The newly developed tool also allows us to create connections among websites, defining relations based on their connection to the same tracking devices, giving insight into the fluidity of content. In short, by repurposing the Ghostery tool we are able to characterize different collections of URLs. We are further interested to study tracking ecologies in a number of URL collections, issue spaces or web spheres, to see if there are specific trackers at work in particular countries, whether data-protective countries or web spheres deploy less tracking devices and whether countries like Iran use trackers from major US corporations. On top of that we are interested in which trackers are at work in the news sphere, in specific issue spaces, such as health/addiction sites, adults’ and childrens’ sites, privacy-concerned sites and technology blogs. The wider aim of the project is to contribute to explicate and make more concrete the more abstract claims of ongoing data-veillance in the back-end by providing detailed insights in the ecology and economy of tracking. 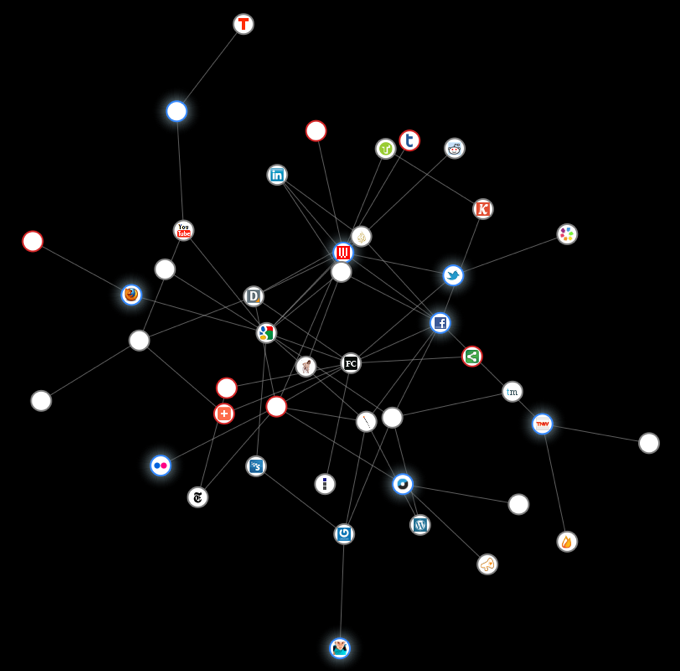 A few days ago, Mozilla launched a new Firefox add-on named Collusion that will show and map the network of trackers in realtime while surfing – a seemingly lost web skill in the era of the search engines and social networks – the web. Kovac from Mozilla stated during the launch that: “The memory of the internet is forever,” Kovacs said. “We are being watched. 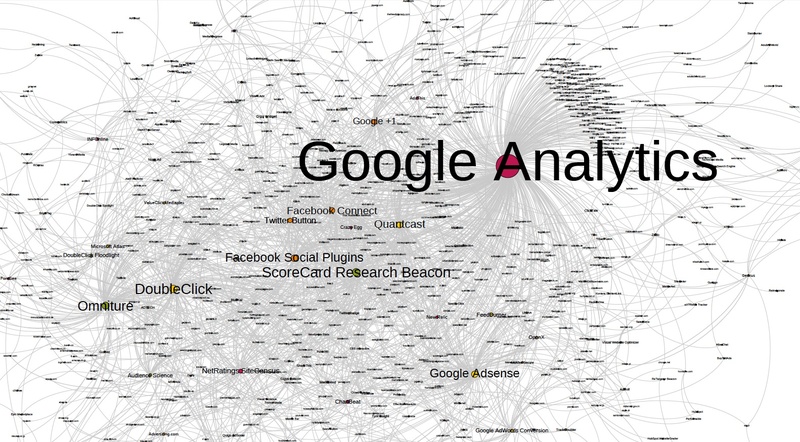 It’s now time for us to watch the watchers.” Below a map of the trackers tracking me (in less than thirty minutes) while reading a few articles. The two tools have a similar intention but they differ in their approach. Track the Trackers allows you to characterize a predefined set of URLs while Collusion allows you to monitor the trackers involved in your individual browsing behavior.